This stunning metallic belly dance costume skirt is an exciting addition to any belly dance wardrobe! 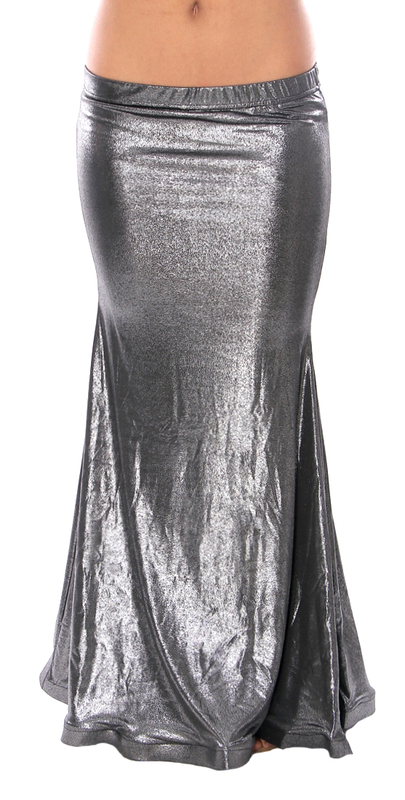 This stunning metallic mermaid/trumpet skirt is an exciting addition to any belly dance costume! Ideal for modern dance, belly dance, tribal, and tribal fusion styles, or evening wear. Soft, lightweight black polyester blend stretch fabric with metallic print. Features an extra panel in back for fullness, an elastic waistband, and a polyester horsehair braid hemline for weight and shape. S/M- U.S. Women's Standard Sizes 6 - 12. Waistband / Upper Hip: 30 - 39 inches; Lower Hip: 33 - 41 inches; Length: 38 inches. M/L- U.S. Women's Standard Sizes 10 - 16. Waistband / Upper Hip: 32 - 42 inches; Lower Hip: 36 - 44 inches; Length: 38 inches.